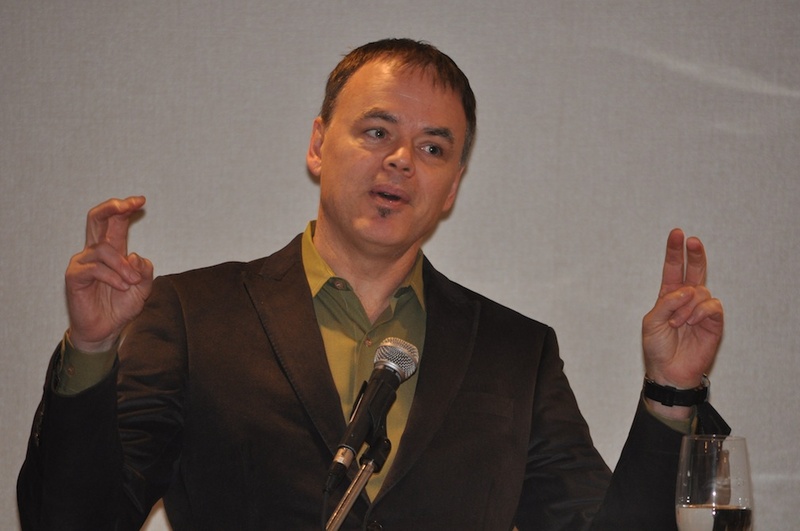 Economist “Jimbo” Stanford speaking Sunday morning at the Ontario Health Coalition conference. Somebody suggested that the CBC would be a far more interesting place if the Lang-O’Leary Exchange morphed into the Lang-Jimbo Reality Show. Now that’s a CBC we might be inclined to fight a little harder to protect. There are not many economists who would take on the moniker of “Jimbo,” but Jim Stanford doesn’t shy away from it. Speaking at the Ontario Health Coalition weekend conference at the Toronto Sheraton Centre, the Unifor economist and founder of the Progressive Economics Forum was in high spirits. “An economist is someone who is good with numbers but hasn’t the personality to be an accountant,” he told the crowd with a big wide grin. Don’t be fooled, “Jimbo” has personality to spare. With a Master’s degree from Cambridge and a Phd from New York’s New School for Social Research, Stanford doesn’t come across as pedantic. Early Sunday morning he finds ways to convey complex economic principles clearly to a mixed community audience of under-caffeinated seniors, labour and young people interested in health care advocacy. Stanford has been doing this for much of his career, including writing Economics for Everyone: A short guide to the economics of capitalism. That textbook has become a staple for those who wish to know more about how economics work in order to take on the issues of the day. “Health care (costs) are going up because we are aging and we are willing to pay more,” he said this weekend. Stanford explained that it’s rational that Canadians would want to take advantage of new technologies that would extend their lives or improve the quality of life. Yet health care, along with other vital government services, is under assault because of ideology, not because of any economic imperative. Stanford says that austerity is being used to reinforce power and influence, not because it makes economic sense. When governments cut back, they are also throwing people out of work at a time when jobs have yet to recover from the great recession. The economist explains that when you throw a cat off of a high building, when it hits bottom it bounces back up again. “But the cat is still dead,” he says. That’s a little like the employment situation in the province. The recession of 2009 led to the biggest drop in employment in Ontario since the 1930s. While there has been some recovery, we are nowhere near the percentage of working-age people who were employed prior to the recession. In fact, that “dead cat bounce” has only come back about a fifth of the way. Throwing more people out of work through public sector cuts is not the answer. Officially there are 1.4 million Canadians who are unemployed, but Stanford says the true number is closer to 2.3 million, or about 12 per cent of the workforce. Stats Canada doesn’t count those who have simply given up looking. For many who used to work at Stats Canada, they may very well be among them. If Canada were to focus on creating two million jobs, it would add $200 billion into the growth of the national economy. At Canada’s current tax rates, that would generate $70 billion in new revenues for the federal and provincial governments. “That would be enough to pay off all the deficits we have and still have 10s of billions of dollars left over for other priorities,” he says. Stanford points out that there is neither a scarcity of money or capital – two of three conditions necessary for economic growth. Money is created every time a bank issues a loan, and corporations are sitting on more than $600 million in liquid assets. “They (corporations) continue to take in more money that they know what to do with.” Stanford says you know that taxes are too low when corporations like the Royal Bank start using that capital to buy back their own shares. The third condition for economic growth is labour. Only once in our history has there been a true labour shortage – during World War II. During that war there was a collective decision to use all our resources towards a single end. Stanford says we should now declare war on poverty and climate change and put Canadians back to work in the same way. The economist warns not to be fooled by Tory claims that we are number one in job creation. In fact, if you look at comparable employment rates among developed nations, Canada ranks 20th out of 34. Countries like Korea and Germany have recovered from the recession. Even countries like Italy are doing better. With interest rates at rock bottom, rising debt does not mean there has been a corresponding increase in interest charges to government. When inflation is taken into account, the cost of borrowing is now close to free. Stanford says there is considerable room to accumulate debt until such time as the economy truly recovers. He says that there is an “Animal Farm” mentality towards debt right now. For the private sector debt is good. For the public sector debt is supposed to be bad. While the U.S. may face a structural deficit – an indication that taxes in that country are too low – Stanford says that is not necessarily the case in Canada despite a rate that is already below most other nations other than the U.S. and Japan. The evidence for that is the consistent surpluses the federal and provincial governments generated prior to the recession. Given this obsession with deficit, would even a short-term hike in the tax rate make a difference? Over the last five years taxes in Canada have dropped by 2.6 per cent relative to the size of the economy — from 39.8 per cent to 37.4 per cent. If our tax rate were the average of the member nations of the OECD, we would generate $50-$60 billion more in government revenues each year. Norway, which leads the world in social standards, has a tax rate that accounts for 58 per cent of the size of their economy. Stanford says we need to debunk the self-defeating logic of austerity and reject the human and social consequences. He says we can do that by increasing the political costs and, as perverse as it sounds, to demand our right to pay taxes. More on this weekend’s Action Assembly later in the week. This entry was posted in Uncategorized and tagged Austerity, Debt and deficit, Jim Stanford, Ontario economics, Ontario Health Coalition. Bookmark the permalink.